Will leads or sales just start rolling in? How long does it take for Google Adwords to work? In this article, we’ll answer these great questions by walking you through the beginning of your new PPC campaign, and share what you can expect to see and learn from after the campaigns go live. Hopefully your PPC firm has set up campaigns to show your ads for keywords related to your business, and ideally ones that will drive results (typically leads or sales). Conduct a few searches that you have agreed upon, see if your ad is showing up and with the correct ad copy and extension information (phone numbers, sitelinks and callouts to help drive people to your site). 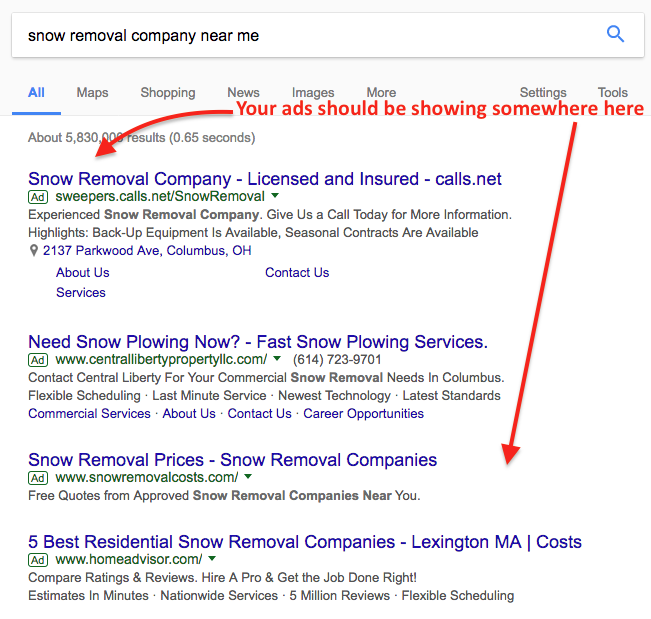 If you are in the geo-targeted area for your ads, and during the times you have your ads running, you should see your ads show up on a search results page. When you first start out however, many times your ads will not be at the very top of the results. It takes some time for Google to approve the ads, and “learn” your new campaign – from the ads you are running, to the website or landing page you are sending your traffic to. Plus, the PPC account manager is trying to understand how competitive the landscape is. He is likely adjusting bids more regularly during the first several weeks of the account to ensure that your ads are in a location that makes the most sense for your business. Our firm likes to try to start out by bidding quite high to start so that our client’s ads are in the top couple positions on average. 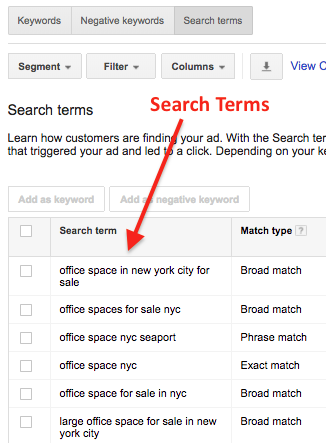 This helps us to learn the account much quicker, and allows for Google to learn your campaigns faster, as well. If your ads are not on the first page or not in the first four positions, it may take some time to get enough clicks to understand how well the campaign is doing initially. Ok, you’ve conducted some searches and you see your ads running – great! But is anyone clicking on them? 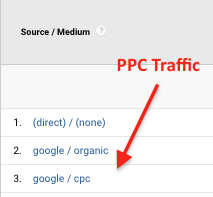 Within the first couple days (even hours) you should see traffic coming to your site from these new campaigns. If the PPC firm has synced your account with Google Analytics (GA), you should start to see “sessions” show up in GA. Similarly, within a platform like Google Adwords you will start to see things like “impressions” (how many people viewed the ad) and “clicks” (how many people clicked through to your site or clicked your phone number). You should be tracking or having your PPC firm report on a number of metrics, but the most important to a business are typically “conversions” (which are basically your business goals). Conversions are typically leads from contact form submissions or phone calls and/or sales from eCommerce purchases. If your business relies on leads or sales, you need to ensure that you or your PPC firm is tracking these metrics and reporting on them. In addition to impressions and clicks, you may start seeing “conversions” coming in shortly after the start of the campaigns. Say whaaa? – You’re telling me that I might get traffic from searches that I might not want? Yes, I’m telling you that, but it’s not necessarily a bad thing, as long as you or your PPC firm does something about it. Let me explain. When we bid on keywords, say for instance, “custom bicycle” for a bicycle retailer, Custom Bicycle is the “root” keyword that Google uses as a basis, if you are using a phrase match or broad match modified keyword. They may find other related keywords (or what we call search terms) based off of that root like “buy a custom bicycle” or “custom bicycle builder online” or “ok google what is the best custom bicycle shop online” (cough cough – voice searches! ), and any number of combinations that may be great keywords that you didn’t have in your campaign in the first place, or could have even surmised. This strategy helps us to identify other areas of search demand and doesn’t restrict our bidding to very specific terms that may or may not convert. A PPC manager’s job is to look at this “search query” data on an ongoing basis and “negative out” or get rid of any keywords that do not fit the core business and that they don’t want traffic for. They will also identify new opportunities that they may not have known about in initial keyword research. Note: Our firm typically doesn’t utilize straight broad match for many campaigns, but have utilized it in some accounts to identify new areas of opportunities. Talking about keyword match types and strategies is an entirely separate conversation, but what you should know is that a exceptional PPC firm will utilize a good mix of phrase, broad, broad match modified and exact keyword variations to target your core keywords. Doing so helps to discover new opportunities you may not have thought of or discovered in your initial keyword research. In summary, at the beginning of most of our campaigns, we may see a number of search terms driving clicks to your site that aren’t as targeted as we would like. This is normal, and not something that typically encompasses a large percentage of your overall spend. It is the cost of exploring new opportunities for keywords that ARE great and effective in driving leads or sales for your business. And over time, we “negative out” those non-targeted keywords and reduce the number of unwanted search terms over time. And subsequently, we find new, additional search queries that do convert well and add those to existing campaigns to drive more conversions at lower costs. So, it’s wise to start off a bit more broad and work to tighten up keyword targeting over time. It’s an ongoing process that NEVER ends! How Long Does it Take PPC to Work? By “work”, I assume you mean start to drive leads or sales. This actually varies by client and other factors like budget, competition, seasonality, and the way you or your PPC firm have set up the campaigns and even landing pages. We have had campaigns start working in the very first day, and we have had others that take several days or even weeks to start generating the types of metrics clients want to see. The most important thing is to define your goals from the start or work with your PPC firm to identify PPC campaign goals. They should be working on achieving those goals and delivering reports and feedback about how their work is attaining or not attaining those goals and what can be done to improve. While PPC Campaigns can be turned on instantly to start driving targeted traffic, the campaigns will not work if they aren’t actively managed or managed with someone who doesn’t know what they are doing. We have seen so many clients waste money by just trying to do it on their own without much knowledge about how these campaigns work, or working with a PPC firm who doesn’t actively manage their accounts or pay attention to detail. So, when you begin your first PPC Campaign, keep an eye out for some of the items we mentioned in this article. Need additional help on your next PPC campaign? Contact us to discuss your project.